Chögyum Trungpa began a grand experiment in 1974 with the founding of the Naropa University, that integrated contemplative practice with traditional Western scholastic and artistic disciplines. Where does mindfulness intersect with art, science and the humanities—and in what way does education offer a means for accessing a larger wisdom along with its role of imparting the knowledge gleaned by a culture? These are some of the questions explored by Naropa. 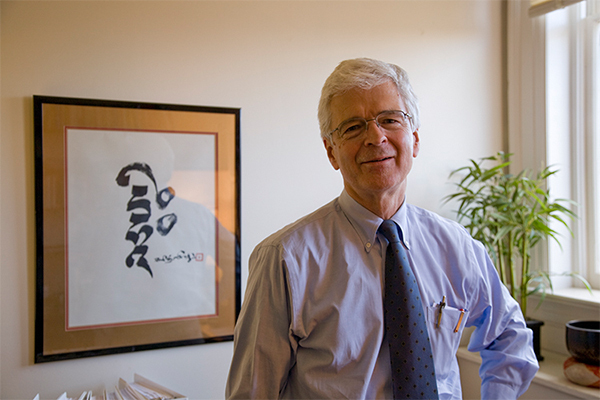 Dr. Thomas Coburn is the recently-retired President of Naropa University, the first university in the United States dedicated to advancing contemplative education. A Hindu scholar and highly engaging conversationalist, Dr. Coburn shares his insights on the relationship between collective intelligence and individual inner work in the educational process. From the moment that we met several years ago, Dr. Coburn and I have enjoyed delightfully deep and rich exchanges. Prior to the interview, we spoke of the challenge of furthering an educational environment like Naropa with a rich collective legacy from the past, namely the founding vision of Chögyun Trungpa and the influence of such artists as Allen Ginsburg, Anne Waldman, and John Cage. Dr. Coburn’s candor and artful dialogue became immediately evident, and with many of the questions, almost as an afterthought, something very new arose unexpectedly at the end of each answer. As he thoughtfully attended to my questions, after a while his careful answers suddenly gave way to spontaneous eruptions of fresh insight. His own integrity and presence confirmed the content of the interview. I am interested in the classroom, in what we do in education — especially in mindful education. In what way do we encourage and allow for that kind of platonic dialogue, that creative intelligence that can grow when people are really working together, in a “right” way. TC: Yes. I have a little bit of a canned answer to that, but I still think it is a good answer. And the reason that it’s in the can is because each semester, I give a talk to incoming students about what is contemplative education. Because I have spend most of my career in the classroom before, as my colleagues would say, I went over to the dark side (laughter), the starting point for that exploration is reflecting on how teaching and learning take place. I know now that of all the multiple variables that feed into effective teaching and effective learning, there is one that rises above the others — and that is for the teacher to catch students at the teachable moment, when they are extended beyond their comfort zone, and hopefully when the faculty member is extended beyond his or her comfort zone. So you can together create that edgy, vulnerable space where unanticipated things happen. In my experience, you get to those teachable moments by one of two routes. One is intentionally, deliberately, carefully, linearly; where the responsibility is on the teacher. It’s the teacher as scientist. He or she, through a sequence of assignments or a sequence of responsibilities, brings students up to the edge of the novel where they then suddenly sigh and say, aha, I see how it works. And that happens both individually and in the aggregate, collectively. I think it is possible to nurture, to cultivate, to grow students toward that kind of incremental gradual breakthrough to understanding. But the other way is to recognize that sometimes in both individual conversation and in classroom activity, for reasons that are serendipitous — filled with grace would be another gloss on what happens — you suddenly find yourself suspended out there with no net. And the responsibility of the teacher is to recognize those moments when they happen and to respond accordingly. And you can’t tell until retrospect whether you’ve got it right, or, more importantly, when you got it wrong. When you get it right, there is an orgasmic sense that a window opens that nobody knew was there beforehand. And you are sometimes aware of those moments only in retrospect, when you go back to your office, after a class and you realized: God, there was a teachable moment there — it was staring you in the face — and you lamely offered some cork in the hole and missed the eruption. So I think that my response to your question would be that we, as educators, are about opening to the mystery of how we can cultivate and grow teachable moments. I think my direct answer to that is that you can do some of that intentionally, and some of that just comes upon individuals in groups. And the preparation for the latter kind has to do with the teacher’s own groundedness, comfort with him or herself, with subject matter, with the weather on a particular day, and with his or her very personal being in the world. DU: It is so true. You see it happening. DU: By design or by intent we can bring something to the class, but beyond that we can watch it happening and there does come a moment — I love what you said — where there is a descent of grace. And we can be grounded and/or receptive enough to go with that, or we can just recognize it in retrospect and miss the moment. Subtle timing is everything and, as you say, we are often too late. This descent of grace, that we cannot capture, but perhaps we can engender and be sensitive to . . . How do you think that this descent of grace can bring the classroom alive and help us touch a knowledge, touch a sense of being, and touch an intelligence that we cannot get to on our own. TC: You can’t script it. That’s both the wonder and the irritation of it. I was about to look for Robert Pirsig’s Zen and the Art of Motorcycle Maintenance, but I don’t have it on the shelf here; it is at home. If I had it I would open it up to about page twelve where he is reflecting on his relationship with his son and his friends John and Sylvia. He talks about how truth comes knocking on the door and if you are not ready for it, you say: Go away. Who are you? So what you want to do is to live in a way that you are always available to the arrival of those serendipitous, graceful, literally graceful moments, But you cannot script their arrival..
DU: You cannot script their arrival. And don’t you find that these graceful moments come more when we are working together? When I am alone, I find something of that in meditation, I do find something of that in my creative work, but I find it more powerfully when I am working with others. Is that part of your experience? Do you see that as being one of the ideals of the classroom? TC: Yes. That’s true, but I don’t want to shortchange the kind of insight that comes out of isolation. TC: Because I think that is one reason that the contemplative life has been so often lived in isolation. There is a kind of access that is only available through discipline, through sensory, if not deprivation, at least constraint; and I think that is true of both contemplatives and of writers — or in all forms of creativity. I’ve had moments, as I am sure that you’ve had had, where, in my case it is pouring over the meaning of a Sanskrit passage and you knock your head against it and then you go away and you come back and it falls apart and you say, aha there it is. And you smile and you giggle at yourself because of your own inability to see it beforehand. So there is a certain kind of insight that very definitely is monastic, that takes place in isolation. But I think that you are absolutely right about working with others — how do I want to phrase this — to the extent that other people are perpetual correctives on our own self-absorption (laughter). Then I think that openness to them, to others, is necessary to become open to a larger reality — a co-created reality in many ways. And I suppose there are demons in both kinds of trajectories. Certainly the isolated contemplative has to face his or her own private demons, but there are also demons that are there in working with others. And I suppose It is easy when working with others to assume that the demons are all on the other person. DU: Oh boy, isn’t that true. TC: But I think a dispassionate perspective recognizes that one brings ones own and that other people are the vehicle for exorcizing those demons within you as well as within themselves -- and you provide that function for them. So certainly there is that collective breakthrough that happens -- the mystery is still there. It can’t be forced. I suspect that underlying some of the work that you are doing is the book Presence, with Scharmer and others -- the U theory. I can’t improve on the anecdotes that they give there. I’ll just say, see Presence for details. DU: Yes. It’s very true. I would like to get back to what we were talking of earlier about the particular challenges of Naropa and some of the challenges that I am facing at Cornish. We have institutions that contain a very rich legacy of individual insight. In the case of Naropa, what Trungpa Rinpoche, Alan Ginsberg and others brought . . . something very powerful came through them as individuals. And we now understand that this form of inner practice, a contemplative practice, can be very much a part of the educational process. How do we move that forward in a largely secular world? How do we balance acknowledgment of tradition and collaborative discovery with individual practice, especially in institutions that are devoted to group endeavor, the classroom? Yet at the same time we recognize the need for individual depth and growth within that classroom. So it seems to me that what we were talking about before is the need for a creative approach where we are not just translating teachings but that we are bringing something of today and something creative to it. TC: This is an answer, just a little bit oblique. My first appointment this morning was to speak to a group of about 60 folks, prospective students and their parents, about contemplative education. I spoke for about 20 minutes and one of the questions I got was: Where does the legacy of Naropa’s founder Chögyun Trungpa live on? Does it live on and, if so where in Naropa? It’s a great question and I found myself answering it in a new way. Up until today I would have answered it in one way, and now I have to answer it in two ways. And part of that is because I understand the place better now. The obvious answer is that it’s in the curriculum. We now have a particular course that is required for all first year students on contemplative practice, that is both about the specific legacy of Naropa but also about parallel contemplatives in other traditions. So it is both deep on the Buddhist side but also ecumenical as well. But I then realized and said quite spontaneously this morning: there is something in the water or in the air that I have come to see profoundly connected with the founder and I told the following story. You have been in academia a long time and you yourself have come through a recent interview process. And you know that in most colleges and universities the interview processes are not pretty events (laughter). They do tend to bring out the ego in a genus of people who don’t need any help in growing their egos. I say that although I am an intellectual and have spent thirty years in higher education. One of the things that got me to Naropa was a movement beyond that ego-centered culture that is so pervasive of higher education. My own experience of the interview process here was that it was every bit as rigorous as one would find in other institutions. But there was something else, and, in the Naropa language as I now know it, there was a container, or a cushion, underneath the entire process that nobody ever verbalized. I think my intuitive radar was out during the entire time so that I picked something up, but from what? … from body language, demeanor, small little ways of engaging one another. I can remember in particular an hour and a half session where people were hanging out the windows trying to see who this new guy on the block might be. The experience that I had there, unverbalized to me but intuited by me was that people wanted to know what you were made of. They were saying: we’re going to come after you with hard questions Coburn. Because we want to know what lies in your heart as well as in your head. No scripts, no canned answers, just be fully yourself. Having picked that up, then I was, I suppose for the rest of my time here but particularly in that one session. And my wife was in the audience during that session. At the end of the day we were back at the hotel and she looked at me and said: Tom, where did you get that language today? We’ve been together for twenty years and I’ve never heard you talking like that before. What I now have come to see is that I intuited what I’ll call an ever present invitation to ever greater openness. I think that is exactly what Chögyun Trungpa was talking about. It’s a way of being with others. And so there is both a narrow literalist understanding of what it would mean to be continuous with the lineage. And then there’s a more oblique, but even more palpable, non-sectarian, non-doctrinaire quality that is what we are about cultivating. So that’s not a particularly helpful answer if you are looking for a literalist answer to how do we perpetuate the gift that we have been given in our legacy, but it does do justice to my experience of living in that kind of environment. TC: Notice that the language that I’ve been able to use in that second case is utterly non-sectarian. It is a way of being. DU: I too have been through a rigorous recent interview process, both at my job, and I have a new girlfriend so there is a certain kind of interview process that goes on there as well (laughter). And I am really beginning to value those kind of demands. Because in the interview process, I found myself, like you, saying things that I didn’t know were in me. I found that the interviewing process was a catalyst to bring something forth. I find that my relationships are a catalyst to bring something forth. And I am finding more and more in these kinds of situation with others, that when this kind of challenge is presented to me, the challenge to really open from a new place, from the heart, that I find sometimes that words are speaking through me. TC: Yes, That’s exactly it. You’re just the vehicle. Get out of the way, here I come. DU: I know. It is so interesting and I am really beginning to value that feeling of responsibility in the classroom, where I wish to come to that place where I can be open, just simply open and see what comes. For those of us that are still in our formative years in terms of inner practice, what are some of the tools that can help bring this? What can help bring this forth in us where we become simply the vehicle for a new movement, a new dimension. It is so important to the world, is it not? TC: Absolutely. I am not sure . . . I’ve not been anointed by anybody to speak with authority on the contemplative life, but I have become familiar with it both personally and professionally for a lot of years, so what I am about to say is simply my own effort to articulate that. And I don’t think I have anything particularly original to say here. For me starting the day with yoga and some contemplative time is probably the single most important practice. The contemplative life is always a pilgrimage isn’t it, and I discovered in retrospect . . . so much of this we discover in retrospect. I discovered that from my earliest days in the classroom, thirty odd years ago, I couldn’t teach for more than two consecutive hours, because I needed to decompress and then brief myself. But briefing myself didn’t mean the frantic last minute cramming of one’s notes. It meant, having become familiar enough with ones notes, that you could just stand there and look out the window and admire what the maple trees were doing at a particular time of year. So it’s the kind of decompression which is a conscious resistance to a pressure that is greater now than in anytime in my life to multitask and to go faster and better, faster with the assumption that it is better. But I have learned to insert oneself intentionally into that resistance and to take just a quiet moment before somebody is coming in to talk about X and I know it will be a hairy conversation. I’ll just go just watch the Sycamore trees out here for twenty seconds. It is just providing oneself with that quite literally breathing space. But also, reading continues to be transformative. At some level its just reading good fiction before falling to sleep. But I think that my all time favorite course over the years has been, Mystical Experience: East and West. The course involves just a little bit of theory at the beginning and at the end and then just plunging in and reading my friends, who have lived in different centuries around the world and in different traditions. Revisiting them is itself healing and regenerative, no matter how many times you have read them. To watch Shankara, the great Vedantan, go though his argumentation once again, I marvel at his ability. I pick him but I could have picked dozens of people who provide that . . . I sit down with them and they are conversation partners and they have been for much of my adult life. DU: That’s part of the legacy of collective intelligence — the lineage of knowledge that the world has offered us. And, as you say, we have these relationships formed with people from different centuries through reading. I think that is a very powerful statement you just made if people can really think about what it means. TC: I hadn’t intended this but once of the reasons that I love interviews like this is you get new insights. Do you know who Naropa was? DU: I remember reading about him but I do not recall the full story. TC: The short version is that he was the Abbott of Nalanda University, the great Buddhist but also ecumenical university in north India from probably the seventh through the thirteenth centuries. And the story is that one day he was sitting out in the sunshine reading a manuscript of some sort, and this old hag came along and looked at him and scowled and said: “What are you reading?” And he told her the name of the text that he was reading. And he said: “How do I get that inner meaning? And she said: “You have to do your inner work.” So he stepped down from the equivalent of the Presidency of Harvard, and went off to the woods in search of his teacher. So . . . there are two kinds of reading, aren’t there? There is the stuff that is the surface reading and it can be happy, and that is what lots of literature departments are about. But there is also that inner cauldron that literally feeds us. Look at how the language helps us, but you have to take it to heart, because It is a heart activity and not just a head activity. DU: One more question. Contemplative education, people coming together inwardly and outwardly, can this help the world, the planet, the society? TC: Aah. . . it’s the crux of saving the world. What’s my evidence for this? What our alumn are doing is part of that. But I also think that . . . here is the fact of why I am such an optimist. The fact is that deep inner work, as a contemplative exploring oneself, paradoxically ends up dissolving the conventional contrast of self and other. It just goes away. And I can’t explain it any more than I can explain where these teachable moments can come from. And as that fence between self and other crumbles, dissolves—dissolves is a gentler metaphor— then one finds oneself drawn to the reduction of pain and suffering in the world, both in other human beings but also in what we have done to the natural world in which we find ourselves. Which is why I think that one of the great causes for hope in 2008 is our albeit late wakeup to what we are doing to the environment. And I think that one of the keys, apart from the obvious technical mastery of trying to engineer ourselves out of this mess that we have created, is the cultivation of the inner skills to help ourselves and to help the front lines, the environmental activists, keep up the good fight, because it is debilitating. I do not see any way around that short of doing some long-term kind of inner work. DU: Tom, I honor you. You are the kind of college president that has not gone to the dark side (laughter). The fact that your own inner work is so very much alive. And the fact that you think about these things, and that your own creativity is alive. I thank you and I am sure that Naropa thanks you as well. TC: Well, thank you David; it’s always fun . . . thank you for the questions. I think that these kinds of conversations come more easily now that I have been here a while and I can take the pulse of what we are doing. And of course college presidents worry about things like budget and planning and buildings, and all that kind of stuff, and I still worry about that. But the vision that makes all of that — life in some sorrow — worthwhile is the intimation of a higher horizon. Dr. Coburn holds a BA in religious studies from Princeton University and a MTS and PhD in comparative religion from Harvard University. He is a well-known scholar of the great goddess tradition in Hinduism. He has lectured broadly in the United States and India, and is a widely published author specializing in comparative and Asian religion. Dr. Thomas B. Coburn became president of Naropa University on July 1, 2003. Prior to assuming this post, Dr. Coburn served from 1996 to 2002 as vice president of the university and dean of academic affairs at St. Lawrence University in Canton, New York, where he was also the Charles A. Dana Professor of Religious Studies.